Update 4 of ESO is now available on PTS. The features are listed below. Welcome to The Elder Scrolls Online v.1.4.0, our fourth major content update! In this update, we’ve added the upper region of Craglorn for you to explore, plus a new Trial – Sanctum Ophidia. We’ve also added the Dragonstar Arena where you’ll be challenged to defeat 10 stages of monsters with a group of 4. The Veteran Rank cap has also been raised to VR14 to account for these new encounters. We’ve begun our grouping improvements to many PvE objectives, and have continued our work on expanding existing delves. You’ll also find that we’ve added new ability altering enchantments, which you can read more about below. In addition to all new features, we’ve continued to improve many areas of the game including gameplay, art, itemization, quests, UI, and the Alliance War. We hope you enjoy the latest update, and be sure to let us know what you think! Venture north from the badlands surrounding the city of Belkarth into new territory! With the western rockslide cleared and the Iron Orcs’ barricade sundered, the roads to Dragonstar are now open to travelers. Here, the insidious Scaled Court and their Iron Orc allies prepare a new invasion force for their master, consisting of terrible monsters created using the ancient alchemy and magical processes of the long-dead Nedes. Six new group delves, three new group instances, and the settlement of Dragonstar await you! Enter the heart of the Scaled Court’s power and face off against the Celestial Serpent himself. Make your way through the most loyal members of the Scaled Court and fight the monstrous Trolls and other nightmares the Scaled Court command in defense of their god. Those that return to Hel Ra Citadel or the Aetherian Archives after facing the challenges of the Sanctum Ophidia will find their actions have not gone unnoticed. In the mountains north of Dragonstar, an abandoned ruin has been repurposed to serve as a blood sport arena by a heretofore unknown champion. Warriors from across Tamriel now flock to compete in the arena games with the promise of great glory and fantastic treasures–if they can survive. Available in both normal and veteran modes, a group of four players can enter the ring and pit themselves against some of the deadliest challenges yet seen! A new crafting trait, Nirnhoned, has been discovered in Craglorn! The necessary trait items can be found rarely while harvesting in Upper Craglorn, and Nirnhoned equipment can be obtained by completing the main quest line in Upper Craglorn. The delves found in Bangkorai, Reaper’s March and The Rift are now larger, and contain more monsters and loot. This is an ongoing effort to make all delves in the game larger. We have implemented a priority and distance-based culling system that ensures all pertinent ability FX play on you and your group, and take priority over other effects so combat cues are not lost. This system was implemented to improve FX memory management so that important FX are not being culled out in a high-density combat situation. In addition to fixing issues where ability FX may not render, this system will also improve overall performance in some PvP scenarios and Dungeons. In order to provide for new itemization and to ensure a better feeling of achievement in Dragonstar Arena, Sanctum Ophidia, and Upper Craglorn, the maximum Veteran Rank has been increased to 14. We’ve added powerful new ability altering enchantments that can drop on weapons found in the Dragonstar Arena, the Serpent Trial in difficult mode, and from the Alliance War Leaderboards. Grand Healing: This ability now restores stamina to allies in the area. Cleave: This ability deals bonus damage on the initial hit. Puncture: This ability heals the caster. Twin Slashes: This ability deals additional bleed damage every tick. Poison Arrow: This ability increases your weapon damage when attacking enemies affected by Poison Arrow. Destructive Touch: This ability deals more damage and costs less. Increased the cooldown on the Honor Guard and Mage ability Unstable Core. Increased the amount of points you earn towards Campaign Scoring while you’re an underdog. Rewards for the Worthy mails now contain gold. The End of Campaign Leaderboard rewards now contain items if you are in the top 10% or higher for your Alliance. The top 2% of the Leaderboard for each alliance will receive a gold set item and an ability-altering weapon. The top 3% – 10% of the Leaderboard for each alliance will receive a purple set item. While you are within the walls of larger keeps (such as Warden), the range of Fiery Grip and its morphs will be reduced. You will no longer fall through the world when using the alternate entryway into Cracked Wood Cave. Alliance War equipment bags now have a chance to contain Grand Soul Gems. Animations are now smoother when drawing or swapping your weapon while moving. Your animation will no longer get stuck when you die while jumping backwards. Improved the Troll’s movements during combat and added additional personality. Eating consumables using the Quickslot will now only play audio and FX during combat to provide clear feedback without interrupting the combat experience. Fixed an issue where the bowl and spoon would stay in your hand after eating. They now disappear once food is consumed. Fixed an issue with the Centurion’s feet sliding and clipping when using his whirlwind attack in Craglorn. Fixed an issue where your eyes would rotate improperly when kneeling to examine something. Attacking with a one-handed weapon while in first-person view no longer forces you into third-person view. Bows will no longer clip into the quiver while sheathing. The Ice Wraith will now die on the ground. The Giant Scorpion now animates more smoothly when knocked down. Fixed an issue where the wrong audio would play when the Skeever and the Wisp were knocked up into the air. Flying monsters will now animate more smoothly when knocked back. Fixed an issue with the Witchlight’s movement not working properly. The Watcher’s tentacles will no longer clip through the ground when knocked to the ground. We also fixed an issue with the Watcher’s eyelid movement. Fixed an issue where the Harvester’s attack would not animate smoothly. Fixed an issue where the Hag Raven’s death animation would not animate smoothly. The Gargoyle will now animate properly when it receives a critical hit. Fixed an issue with the Wolf twitching upon death. The Lamia will no longer turn her head inappropriately while using the ability Howling Strike. We also fixed an issue with her tail not animating smoothly while moving. The Kwama Warrior now moves its arms properly when attacked. The Giant Snake now moves its head properly when using the ability Lash. We also fixed an issue with the Giant Snake that would occur when knocked back. Adjusted the walking and running animations for the Bear so he moves more smoothly while navigating. Fixed an issue with the Air Atronach that was causing it to shift oddly while idling in combat. Fixed an issue where the Fighters Guild Champion would not animate properly when killed. Fixed an issue where the Spider Daedra’s face would flicker when killed. Fixed an issue with the Senche’s leap attack. The Gargoyle dungeon boss’ hands will no longer clip through each other. Fixed an issue where the Khajiit Male cheekbones would clip through hoods when the Jaw Size and Cheekbone Height were set to max for Heroic and Angular face types. Fixed an issue with the Wolfhound’s mouth. Fixed an issue with the Blue Mudcrab’s textures. Fixed an issue where some Altmer male NPCs were wearing female clothing. Fixed an issue with the Argonian version of high-level Nord heavy helmets where the wrong textures were being used. Fixed an issue with the dye areas on high-level Orc light chest armor. Fixed an issue where skin would show through on high-level Orc light robes. Fixed an issue with high-level Dunmer medium helmets where your eyes would poke through the eyeholes. Yikes. Fixed an issue where you could see through the Wasp’s body. Fixed an issue in the Rift where Drauger would float above the sarcophagus. Adjusted the lighting in Vaults of Madness where it was too bright in some areas. Fixed a number of camera collision issues in Doomcrag Tower. Fixed a number of texture and collision issues with rocks in Craglorn, Cyrodiil, Coldharbour, and The Rift. Made several improvements to fire FX and textures. Improved the FX when you light a siege weapon. Improved many FX for Nightblade abilities in first-person view. Improved the FX for many Dragonknight abilities. Improved the FX for the shock status so they are more visible and consistent with other shock FX. Fixed several FX issues with the abilities Snare, Inner Light, and Petrify. Improved the FX for the Nereid’s abilities. Improved the FX for ghosts for better all-around visibility. Improved the FX, visibility and lighting for the quest Conflicted Emotions. Added and improved the level of detail for a number of items including mine cranes, ice rocks, Craglorn braziers, Daedric doors, Ayleids, Crypt of Hearts chandeliers, Argonian Ruin walls, and various Breton sets. Fixed an issue with camera collision in caves. Fixed an issue with collision on Cave Mine Doors that was causing the doors to be stuck in an open position. Fixed a texture issue with a number of cave assets. Fixed an issue with collision in Craglorn dungeons that was causing errors to appear in-game. Fixed an issue with the Craglorn floating bridge level of detail. Fixed a texture issue with various Argonian ruin assets, Dwemer dungeons, Nord dungeons, Nord houses, and Ayleid Welkynd stones. Fixed an issue with textures on Altmer towers, doors and house interiors. Improved the collision within Altmer houses, Breton city walls, Hist bases, and Ayleid rubble piles. Repaired texture seams on Breton houses and lights. Fixed an issue where gaps were visible on Daedric doors. Fixed an issue where collision was missing from Ayleid metal decorations. Fixed an issue with the collision on Dwemer smelters and Nord dungeon walls so the camera will no longer go inside the asset. Fixed an issue in the Tribunal Temple so you will no longer fall through the floor and get stuck in walls. Fixed an issue with Nord dungeon floors and Redguard barn floors so you and NPCs will no longer float on the floor. Fixed an issue where the Redguard shack would appear to flicker. Fixed an issue where you could become blocked on the Redguard Ruin Gatebridge and the Skull Cell in Crypt of Hearts. Fixed an issue where there were holes within the floor in Crypt of Hearts, inside Khajiit ruins, and on the Coldharbour Tower. Fixed an issue where the Nibenese small house would appear black from certain distances. Fixed an issue where your camera would pass through Colovian houses. Added ambient audio and/or music to many areas that previously had none. Rebalanced the audio of many lines of VO for more consistency. Polished many monster and ability sounds. Polished the timing of many theater moments to improve realism. This is an ongoing work in progress. Improved the audio for many enclosed spaces as you are moving into and through them. Polished the overall audio for Staves. Fixed an issue where you could get stuck in combat with Trial bosses after activating an Ultimate ability. Disintegrated NPCs will now have a loot glow around their ash pile. Clarified several ability tooltips and fixed some grammatical errors. You will no longer be taken out of stealth when you weapon swap with an item set equipped. Fixed an issue where spell effects wouldn’t play when using a weapon with Hardening, Crushing, or Weakening. Dark Cloak: This ability no longer stuns crowd-control immune bosses when you are alone. Eclipse: Fixed an issue where the caster of this ability was being charged magicka every time a spell was reflected. Acid Spray (Arrow Spray morph): This ability no longer uses Spell Critical Strike. Arrow Spray: Reduced the cost of this ability by approximately 10%. Scorched Earth (Volley morph): Fixed an issue with this ability where the red telegraph ring was bigger than the size of the effect. Snipe: Reduced the cost of this ability by approximately 20%. We also reduced the cast time for this ability to 1.8 seconds from 2 seconds. Volley: Reduced the cost of this ability by approximately 30%, and removed the minimum range on this ability. Fire Staff heavy attacks will no longer produce 4 fireballs if your target is out of range. Unstable Wall of Frost III: Fixed an issue where this ability was doing less damage than expected. Uppercut: Reduced the cost of this ability by approximately 20%. Healing Springs (Grand Healing morph): This ability now restores magicka from up to 3 allies instead of 6. Concentration: This passive will now provide 2%/4% spell penetration instead of 3%/6%. Agility: Fixed an issue where this passive was stacking the bonus from Ranks I and II. Fixed an issue where you couldn’t use a light attack if you were using a heavy attack when the Werewolf Transformation ends. Bone Shield: This synergy can no longer be stacked when activated by multiple casters. Damage from Silver Bolts, Expert Hunter, and Trap Beast is now based on stamina and spell power instead of magicka and spell power. Fire Rune: Fixed an issue where the explosion effects for this ability weren’t playing when the ability triggered. Scalding Rune (Fire Rune morph): The damage-over-time effect for this ability no longer stacks. Magelight: Fixed an issue where the UI wasn’t updating the Spell Critical Strike rating when it was being activated near an enemy. Barrier: Different ranks of this ability will no longer stack. Added an icon for the Pit Rat Ranger’s Arrow Spray attack. Removed a hint about taunt immunity that was causing confusion. Fixed an issue where the Fire Mage’s Fire Runes were occasionally being cast without an animation playing. The Berserker’s Soul Tether ability no longer misses when the monster is blinded. You will no longer receive a large amount of Ultimate from killing Shaman Protection Totems. You will no longer become disoriented after the ability Shadow Cloak has been cast on you by an NPC. However, NPCs will now use the ability Veiled Strike more reliably after they become invisible. You will now see the proper icon when you are being affected by the ability Winter’s Reach. The Burdening Eye Orbs from the ability Burdening Eye will no longer produce corpses when they explode. Storm Mages will no longer walk on water while attacking deep water swimmers. Bleed damage from Bears and Alits can no longer be mitigated by holding block. Trolls will no longer turn in place while ripping boulders out of the soil. Leashing a monster while it’s casting will no longer cause it to teleport back to its spawned location. Welwa will now only kick behind them if there are targets behind them to kick. Negate Magic cast by NPCs will now remove buffs that you cast upon them. Damage from the Mammoth’s ability Stomp can now be mitigated by blocking. Damage from the Giant Bat’s ability Draining Bite can now be mitigated by blocking. NPC Werewolves now fully benefit from the ability Blood Scent, becoming more powerful when it is cast by another Werewolf. If a Lich dies while channeling Soul Cage, the ability will now end without continuing to summon cages. Fixed an issue where you would occasionally see incorrect monster debuffs in the Active Effects window while the monster was stuck in combat. Doubled the inspiration gain from the deconstruction and creation of white quality glyphs. Significantly increased the inspiration gain from the deconstruction and creation of blue, purple, and gold quality glyphs. Deconstruction of glyphs will now result in three separate, even chances to recover each runestone used to create it. This means you will sometimes receive nothing, but could also recover all three runestones. Renamed the enchanting passive Aspect Extraction to Runestone Extraction. Putting points into the Runestone Extraction passive provides an increased chance for each independent roll at runestone recovery. Note: As a result of this change, you will be refunded any points spent in this passive ability so you can decide if you wish to reinvest in the new version. Increased the maximum amount of inspiration that can be gained in a single glyph deconstruction at any given skill rank. Added additional messages to tradeskill hirelings so they can continue to share their adventures with their employers. The first rank of the Alchemy passive skill Medicinal Use will now always increase the duration of potions as expected. Fixed an issue with the naming of some lootable objects. Fixed an issue with the names of some crafted weapons and armor. Fixed an issue where Fell and Brigandine were swapped in the progression. You can now craft up to Veteran Rank 14 weapons and armor items. Critters in Craglorn now appear as Level 1 instead of having a veteran rank. Overland beast monsters in silver and gold tier content will now drop a single type of leather scraps. Fixed an issue that was causing some harvest nodes to not grant an item. Fixed an issue where you could receive multiple items when looting a single item. Fixed a small number of unharvestable resource nodes in Alik’r. Clothing hireling deliveries will no longer include weapon trait items. You can no longer spam Siser of Flood’s Taunt or Sister of Waves Stunning Wave synergies. Keeper Areldur and Keeper Voranil will now spawn properly when you enter the instance with the quest Banishing the Banished. There are now hint pins for the Pirate Disguise Baskets when you’re told to find a disguise. The Roost Mother will no longer go invisible during combat. You are no longer prevented from looting the skull if you die during combat with Captain Blackheart. Fixed an issue where Shifty Tom wouldn’t consistently appear after you loot Atarus. The Lava Queen will now spawn when the first group member arrives at the final boss room. Female player characters will no longer get stuck when swimming in certain parts of the water. Noble’s Rest should properly invite group members after someone has taken the quest. The wayshrine for this dungeon is now located closer to the entrance. Akash gra-Mal will no longer rotate after she has begun to cast her Battlecry ability. The Frenzied Guardian’s abilities, Latch on Magicka and Latch On Stamina, now have correct FX when interrupted. Lions by Selene’s Rangers will no longer appear dark and change colors. Senche Spirits will now act like typical cats, and the Longclaw encounter will reset if you try to lure them into the water. The Swarm Mother will no longer get stuck on top of rocks. Eye of the Storm will now properly reset when you enter a fresh instance. All group members will now be offered the quest Eye of the Storm once it has been accepted by the first group member. Iskra the Omen will no longer rotate while casting the ability Falling Sky. You will no longer be blocked by killing the first group prior to taking the quest Blood and Sand. The Monstrous Gargoyle will now properly reset after he defeats a group of player characters. The Guardian’s Soul ability Hammer Strike will now only hit you at an appropriate range. Uulgarg will no longer continuously cast the ability Terrifying Roar if you are immune to it. The fight with Sister Vera and Sister Sihna will now properly award Veteran Points once the encounter has been completed. Ibelgast will now properly award Veteran Points once the encounter has been completed. NPCs in combat will no longer keep you from reviving when your group has been killed. The achievement Closing the Book will no longer be accessible once Bogdan the Nightflame’s health begins to drop. You can no longer avoid Gamyne Bandu’s ability Torture Session, and now applies damage once the ability has completed. The fight with three Flesh Atronachs will now properly award Veteran Points once the encounter has been completed. Both Sud-Hareem and Mereel will spawn properly if you enter the instance with the quest Blood Relations. Followers will no longer keep you from reviving when your group has been killed. You will now respawn at the proper wayshrine after dying to Blood Spawn. The fight with Allene and Varaine Pellingare will now properly award Veteran Points once the encounter has been completed. Yahif and Gedric will now spawn properly if you enter the instance with the quest No Second Chances. All Bone Colossi will now count towards the achievement Colossus Slayer. The Shattered and the Lost: The Lost One will now reset if she becomes stuck. Fixed an issue where you could become stuck between bookshelves. Hidden players can now be targeted by lightning strikes while in the Entry Gauntlet. Frost traps will no longer affect the Frost Atronachs in the Entry Gauntlet. The Mage Celestial will no longer move away from the center of the island during her final phase. Fixed an issue where the audio from the tornadoes would continue to play after they had dissipated. This boss can now detect stealthed characters. The War Horn prior to the Warrior Celestial’s chamber can now only be blown once. Yokeda Kai can now detect stealthed player characters. Fixed a number of monster abilities that were ignoring the Immovable knockback immunity from the Heavy Armor active. Increased the amount of gold you can get from group bosses. Fixed an issue where the Divines armor trait wasn’t increasing Mundus Stone effects. Reduced the critical strike bonus provided by potions to 20% from 30%. Clothier Chests no longer have a chance of providing weapon traits. Updated several icons for collection items. Fixed an issue where the Potion Speed Glyph wasn’t functioning properly. The Vendor Urildil now sells all types of weapons instead of just axes. Fixed an issue that was causing you to receive incorrect amounts of guild reputation when you unlocked an achievement. You will now receive achievement credit when you become Emperor, and past Emperors will be back-credited appropriately. All achievements now have appropriate icons associated with them. Guild Skill Master Achievements are now correctly listed in the Guild category. Fixed several grammatical errors with item set tooltips. Armor of the Seducer: Fixed an issue where this item set was reducing the cost of ultimate abilities. Mages and Fighters guild quests will now give a set item appropriate to the crafting location that is unlocked. Auriel’s Shield: Fixed an issue so the bonus from this item set will not be removed when you die. Blessing of the Potentates: This item set now correctly decreases ultimate cost by a percent instead of a flat value. Crusader: This item set now increases your dodge chance by 100% for .3 seconds instead of increasing your dodge chance by 30% for 1 second. Deadly Strike: The message “Requires 2H Weapon” will no longer appear when activating Momentum while this item set is active. Death’s Wind: Targets affected by the stun from this item set will no longer slide on the ground while getting up. Destructive Mage: Fixed an issue where this item set was doing 0 damage. Ebon Armor: Fixed an issue where this item set wasn’t increasing the maximum health of your group members. Healing Mage: Fixed an issue where enemy power wasn’t being reduced by this item set. Hunding’s Rage: Fixed an issue where this item set wasn’t applying its bonus for 2-handed abilities. Knightmare: This item set now has a maximum of 6 targets. Night’s Silence: Fixed an issue where this set bonus wasn’t being applied. Sanctuary: Updated the tooltip for this item set to state that the bonus is only applied to group members. Sentry: Fixed an issue with this item set only increasing your detection radius by 0.2m instead of 20%. Sergeant’s Mail: This item set will now work on heavy attacks. Twice-Fanged Serpent: The bonus from this item set will no longer reset when you attack different targets. Way of Air: Fixed an issue where this item set was increasing spell power by a percentage instead of a flat value. Wise Mage: Reduced the size of the effect created by this item set. Yokudan Air: Fixed an issue where this item set was increasing the distance at which you could be detected, rather than decreasing the distance that you can detect enemies. Fixed an issue where you would experience a performance spike when another player character in a different zone would join your group. The Monkey vanity pet no longer has collision with other player characters, and will no longer slide on the ground while walking. Vanity Pets will no longer get stuck in their running animation when they stop near their owners. Amputating the Hand: Fixed an issue that was causing you to not be able to use the door associated with this quest if you were in a group. Past in Ruins: The wave event for this quest will now end if all participants die. Quest Trouble at the Rain Catchers: The Grub Snub Lizard will no longer run away and disappear when he should be following you. Increased the overall difficulty of Captain Blanchete. Sever all Ties: Adjusted the respawn rate for the dremora associated with this quest. Well-Armed Savages: Fixed several issues relating to quest pins for this quest. Ensuring Security: Fixed several issues relating to the map and compass markers for this quest. Quendeluun: The Quendeluun Veiled Heritance will now give the proper UI feedback while disguised. The Veiled Choice: Fixed an issue that was preventing Rolancano and Palith from appearing. A Thirst for Revolution: You will no longer become blocked if you leave the Tavern on the step to question Maradem, and later return. Imperial Infiltration: Fixed an issue that was causing this quest to complete prematurely. Beyond the Call: You will no longer be able to enter the ruin until you are on the appropriate step. The Walking Darkness: Dame Valyrie Spenard and Father Quiston Malyne can now be found outside the church when expected. A Marriage in Ruins: You will no longer be able to enter Nilata Ruins until you are on the appropriate step. The Final Assault: You can no longer use your horse inside the Labyrinth area. You can still use your horse in the exterior staging areas. Vision Quest: Fixed an issue if you engaged the General in combat and he died, the General and Scamps would not reset or engage in combat with other player characters. We also added a new portcullis near Shad Astula to fix an erratic quest marker. Increased the overall difficulty for Beralagr. Best of the Best: Golden Jack can now be killed by lepine explosions. 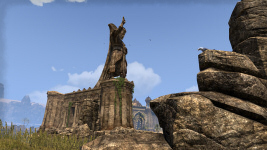 Legacy of Baelborne Rock: Fixed an issue where you could not interact with the Daedric Warding Stone. Can’t Take it With Them: Fixed an issue where the quest pin was not always above Finvir’s head. Wyrd and Coven: You can no longer siphon power from a Hag corpse multiple times. Bosmer Insight: Brackenleaf’s Heart has been lowered to allow easier interaction. Flipping the Coin: Fixed an issue that could prevent Tulira, Gobani, and Cinder-Tail from appearing. Increased the overall difficulty for The Heart of Rootwater, Jahlasri, and Gathongor the Mauler. You will now properly discover Bramblebreach. The Amronal of Valenwood: The quest item Amronal’s Head is no longer restricted by level. A Storm Upon the Store: A quest pin will now appear on Larnil’s Gear after choosing to free the hostages. Retaking the Pass: This quest can now be shared with others. Bitterpoint Strand: The Cursed Chest will now give level-appropriate rewards. Increased the overall difficulty for Queen of Three-Mercies. Down the Skeever Hole: You will now consistently see a prompt to interact with the crates when on the appropriate step. The First Step: Refined this quest to prevent you from being blocked during the quest step “Watch Ceremony”. Motes in the Moonlight: Fixed an issue that was causing followers to not appear after you left the area or relogged. Children of Yokuda: Fixed an issue where a non-functioning door was blocking you from reaching Captain Kaleen. Bonesnap Ruins: The Eternal One now uses a champion health bar and has received a slight increase in difficulty. Izad’s Treasure: The Warrior statue can now be seen from the lighthouse when your graphics are set to minimum. Increased the overall difficulty for Shellcracker, Ozzacha, Ozzacha’s Calf, and Strifeswarm Champion. Increased the overall difficulty for Indur-sa. A Valuable Distraction: The quest assists for finding Menoit’s location have been improved to reduce confusion. The Shackled Guardian: Fixed an issue if you initiated the ritual and died, the ritual would despawn even though other player characters were present. Through the Shroud: Lieutenant Belron will now participate in combat. Blood Upon the Soil: Rilyn will now be easier to defeat. Riften: Fixed an issue where you would dismount while riding through a sewer tunnel near the market. Storming the Hall: Vigrod will no longer disappear when he reaches the hall. Problems Into Profit: Jorunn’s Commedation is no longer rewarded by completing this quest. Scion of the Blood Matron: Revised the quest markers within the Blood Matrons Crypt so they are less confusing. When you toggle the Death Recap window on or off, this setting will now be saved locally on your machine. Fixed an issue where some center screen notifications would no longer display after extended play sessions. Fixed an issue where you were not receiving a confirmation message when you chose to clear a message. Fixed an issue where the dye system UI sounds would stop playing after clicking on multiple saved sets in quick succession. Fixed an issue where the bank size upgrade fee would not update until you left and re –entered the menu. If you use a cook pot before knowing any recipes, you will now be told why your list of recipes is empty. ESO GameMasters (GMs) now have an icon (a black box with a Z in it) that will appear in your in-game chat window. In addition, their chat text is now the same color as the channel they are speaking in. Fixed an issue where the group leader pin was remaining at the leader’s position when you would encounter a loading screen. Fixed an issue where summoned pets were not displaying a follower icon. Siege Weapons will now appear in the Other filter within the Siege subcategory. When a search is conducted and no items are found, you will now be told that no items were found. Trash items in your inventory will no longer appear as items that can be sold when posting in the Guild Store. Guild History will now last longer than 24 hours. Everything under the General category will be cleared after 180 days. This includes the Roster Changes, Customization changes, and all locks/unlocks. All other categories will have their history cleared after 10 days. We have removed the “Guild Invite Sent” event from the guild history. Added a confirmation message when you remove a player character from a guild. Added a message that is sent if you are removed from a guild. Fixed an issue where items that were being interacted with while you encountered a loading screen were occasionally being set to a locked state. Fixed an issue where item enchantments were not being displayed in the buyback window.